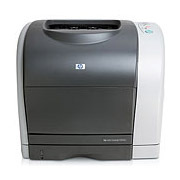 HP Color LaserJet 2550n printers are known for their performance as well as the quality of their print work. This particular model prints up to 20 pages per minute (ppm) in monochrome tones and up to 4 ppm in color. It’s a sturdy, dependable workgroup color laser printer that won’t let you down. You rely on this printer to produce high-quality print work, and you know you can get excellent print quality from using original equipment manufacturer (OEM) HP toner cartridges. What you may not know is that you could be saving money while still getting the same level of print quality. 1ink.com offers toner for HP Color LaserJet 2550n printers at an incredible price. Instead of having to choose between OEM quality and cheap toner prices, you could be getting the best of both worlds. Our remanufactured HP 122A toner cartridge provides you with the professional print quality you need while lowering your expenses by over 50%! Put 1ink.com’s remanufactured toner in your printer and see for yourself how we can help you get the results you need for less.